Do you know what’s in your soil? It’s probably Kentucky bluegrass, the most popular turf grass in Michigan. That’s the kind of sod most landscapers will suggest you install. Unless you opted for a hard-to-maintain type of ground cover, your lawn grows the most when the weather’s cool – but not cold. In other words, you want the warmth of the sun and the coolness of the nights. Whatever you want to accomplish with your grass in time for cookout season needs to be tackled in early. And the earlier you get a jump on the preparation, the better. With the danger of frost in the rearview mirror, it’s time to start watering again. Because roots will undergo tremendous growth now, it’s essential to commit to a regular schedule. However, don’t try to make up for a missed watering session by turning on sprinklers in the dead of night. You invite fungal disease to decimate the plants. Instead, wait until the next morning. Better yet, talk to our landscape experts to put your system on a timer. There are so many fertilizers at the big box home improvement store. Which one’s right for your lawn? Unless you take a soil sample for analyzing, you won’t know. If you pick just anything off the shelf, it could do more harm than good. One of our technicians will be glad to come out and handle the testing for you. They can even do the fertilizing. It saves you money because you won’t buy the giant bag of fertilizer that then sits unused in your garage. 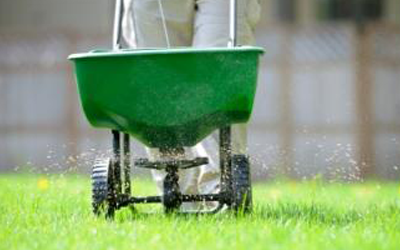 If you’ve waited too long to get fertilizing done before summer, don’t worry! You’ll have another chance in early fall. 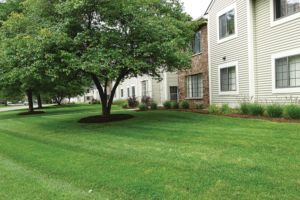 Michigan winters are tough on grass and now that we’ve told you what you need to know about spring lawn preparation If your soil is densely compacted, it needs some loosening of water and fertilizer to penetrate to the roots. It’s possible to rent a lawn aerator to get the job done. It’s a fair bit of labor. Once again, United Lawnscape pros can do this job for you. They can also tell you if they see other problems with the grass. For example, did you know that mowing your lawn too close to the ground opens the door for weed growth? You might try to get out of doing the chore every week, but you’re putting the health of the lawn at risk.